We had two different chefs come in and cook for us... Chef Ronald did a more elaborate meal, per my request, since it was my husbands 70th birthday and Chef Julian prepared an elegant and very tasty family meal. I would recommend both of them! We were so impressed with our meal— and recommend for any group who wants both a charming, warm and talented chef in your kitchen all afternoon and evening and a truly fabulous meal. The souffle was light and so tasty and the lamb and gratin out of this world! This was a very very memorable evening. Ronald Guillaume is a super chef and pleasant to deal with. Chef Ronald, as always, 5* plus! We used the services of two chefs during our stay. Both Chef Véronique and Chef Ronald are talented chefs, and the dinners they prepared for us were quite delicious. They both accommodated our various dietary limitations with grace. We had been told that one should not miss the services of Chef Ronald. We would all agree with that statement, as he is both a charming person and a fabulous chef. Really enjoyed our stay and looking forward to returning again in the future. Everyone in our family thought that our time in Provence was our most memorable vacation. The Chefs were personable and incredibly talented. Their food was outstanding. We will always treasure our time in that beautiful, serene place. Totally off the chart! Cannot believe the fantastic dinners and delightful experiences with all! Biggest grateful appreciation to Louise who is tireless and patient with all arrangements and changes and forever gracious to the utmost! 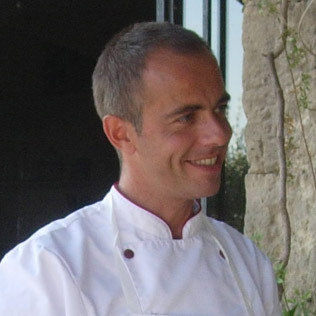 Chef Ronald meet us in Aix en Provence to select a menu and buy provisions. He came to our home, taught a cooking class, cooked our dinner and used the homes furnishing to provide an amazing in home meal. It was the highlight of our week. Merci beaucoup for our delicious dinner the other evening. The food and the experience, enhanced by the magnificent setting and your own decorative touches , will stay with us as a lasting memory of our time in Provence. We loved Chef Ron, a wonderful meal worth the money. We enjoyed shopping at the market in Aix en Provence, and then a cooking class, followed by a wonderful dinner - Chef Ronald and his wife Geraldine were wonderful - we had such a nice evening and the food we made was delicious. Just wanted to thank you for Chef Ronald. He was wonderful, and the meal was perfect. This May was a very special trip for us with lifelong memories. Chef Ronald was a blast and he made some of the best food we have ever had in our life, he was great with the cooking class and helped my 4 year old learn how to cut. Ronald was excellent and accommodating, the Eurostar ensured a few arrived slightly behind schedule but he accommodated us all very well, and the quality of the food, choice of wines were excellent. Chef Ronald was awesome and we had a lovely birthday for my wife. I hope you enjoyed the wedding ! Sorry for taking so long to thank you for the incredible dinner you cooked for us on Wednesday evening . We all thought that was the best lamb we had eaten! From the appetizers (especially the shrimp) to the wonderful dessert , the meal was excellent . Thank you for being part of our many wonderful memories of Provence . What a wonderful birthday celebration I had last week, never have I had a birthday in all my 77 years that topped the delicious food, the beautiful table, the exquisite cake and the fun in the preparation. Many “merci beaucoups” to you and your beautiful Geraldine and adorable Charlie. I will remember that night for years to come and will be looking for you on ABC television. The dinner with Chef Ronald last night was magnifique!! He was very charming and professional and the meal was exquisite; we could not have been happier! We are looking forward to our next meal with great expectation. Ronald has also agreed to bring us a dinner for Friday night that we can just pop in the oven.If he hadn't had another commitment we would have had him come back to prepare dinner at the house again. I hope all is well there. Just wanted to write you a quick note to thank you for the lovely evening you provided while we were in Provence. The meal you prepared was outstanding. We especially appreciate the time and attention you gave to our kids - they enjoyed the pasta you prepared so much that I have attempted to recreate it for them now that we are home! Thank you so much - hopefully we will meet again on future trips to Provence! I just wanted to thank you for another amazing meal last night. We were very happy to be able to treat our friends to such a treat! As always, it was delicious!! Thanks again and until next year!